I am integrating website payments pro. The billing fields are not accessible to edit from the form builder. Can you advise me as to whether I can make the cosmetic changes as per below ... just serves to confuse as it stands. 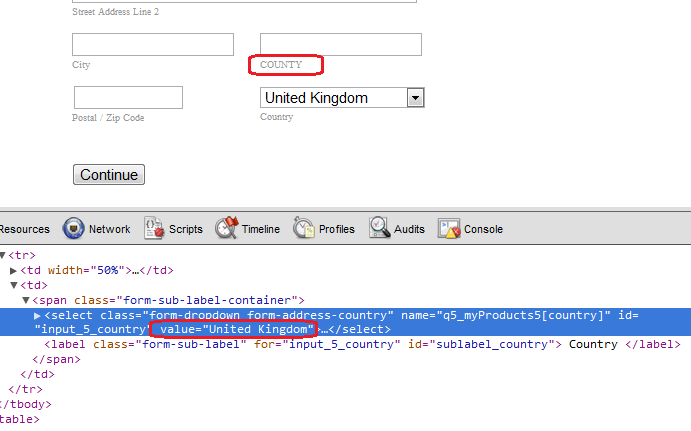 To my knowledge, the only way you can accomplish that is to download the full source code of your form , so you can change the label to "County" and set the Value to a particular country. Can you advise the jotform developers to cater for the markets they sell to with this. Only a clownish business using Jotform in the UK is going to use the existing paypal pro setup, as it stands, because it doesn't talk appropriately to customers. I know one can download the source code and host it on their own servers ... but that's a load of work as a workaround when this is the only hiccup with the form. I have created a ticket and forwarded it to our Development Team. I hope they will find some solution to the problem. As soon as we have any news we will update this thread.